There’s nothing more appealing than two great fighting series getting together for some action. When classic Street Fighter characters meet their match in the anime heroes from Dragon Ball, the result has to be memorable. 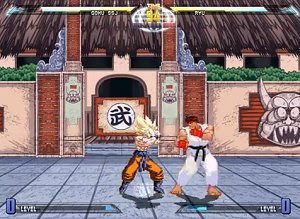 Dragon Ball vs. Street Fighter III is a free fighting game created with MUGEN and offers a respectable cast, with 32 players in total brawling in 33 different scenarios. To compliment this, there are several game modes to choose from, such as Arcade, Training, Vs., and more.